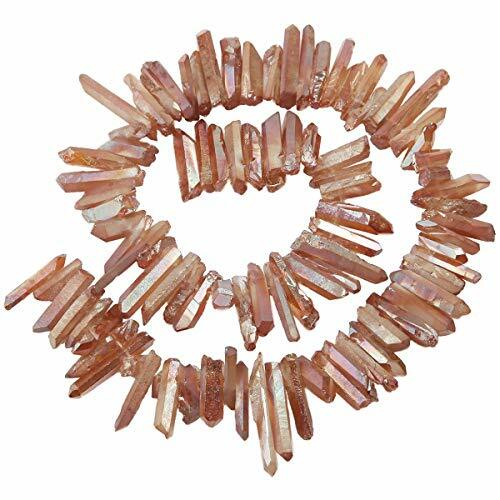 1 strand of crystal points titanium coated quartz sticks point beads.Beads are natural and vary in size and shape.Photos are representing items from lots. Colors can vary from lot to lot. The beads vary in size but range between 0.4"-1.3"(12-35mm);Quantity:full 15" strand.Weight is approximately 55-80 grams per strand. Excellent gemstone for necklace,bracelet,earrings,jewelry making,DIY,art design,beadworks,wire wrapping,handcrafts and more.These crystal point beads are good for balancing the chakras on a daily basis and to enhance chakra healing.Full of energy and power! The natural quartz point starnds have been specially treated in a process where a molecular layer of titanium plus other metals has been fused to the surface of the quartz. This results in a permanent coloring of the surface creating a brilliant effect. Materials:Unpolished Titanium Crystal, Coated Mystic Drilled Crystal, pendant beads, Dagger gemstone, Quartz Points, stone, Crystal, Quartz, Raw Titanium Quartz, Titanium Quartz, Rough beads, spike tower beads.